Did you know that deer with relatively larger antlers are more aggressive? That smaller animals have relatively greater metabolic rates? Welcome to the concept of allometry (or biological scaling), which was first introduced in the early 20th century. Allometry is defined as growth of body parts at different rates. And, like in the examples given above, this can be used to explain how characteristics of living organisms change with body size. Differential growth of body parts can be explained well in humans. Babies, as you may have noticed, have very large heads in comparison to the rest of their body. This is not true for adults. That means bodies grow at a faster rate than brains. On the other hand, the heart grows at a similar rate to the body (see image). 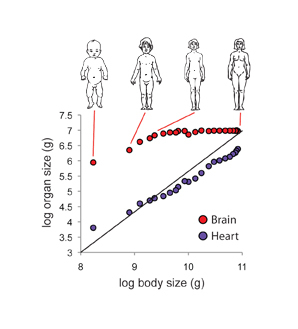 Here, X is body size, Y is the organ size or some biological response (like metabolism), a is initial growth index (size of Y when X = 1) and b is the scaling factor (proportional change in Y per unit X). Why is allometry important in toxicology? Because toxicological response is linked to body weight. Let’s assume a compound is safe at a dose of 5 mg/kg body weight for a particular species. Organisms of the species that weigh at least 10 kg can likely safely consume 50 mg of the compound. But 50 mg can be toxic for organisms that weigh lesser, as their dose would be greater than 5 mg/kg. And that’s why children get smaller doses of medicinal drugs. Similarly, allometric scaling is also used to extrapolate toxicity data from one species to another. Check out this cool allometric calculator here to find out how. Shingleton, A. (2010) Allometry: The Study of Biological Scaling. Nature Education Knowledge 3(10):2.